Beverly, left, and Junior are high school classmates who reunited on the Camino. It is difficult to describe how hearts from around the world bond on the Camino. The togetherness we feel makes this unlike any experience Sue and I have had. So far, it far outweighs the aches and inconveniences. Teen adventure: A high school senior from Maine shared the trail with us for a couple of hours. He was walking for two weeks, having been invited to join a mother and her daughter. The girl, a sophomore from his school, had a knee injury so she and her mom had to rest. He was enjoying being able to drink beer in the bars on the Camino. We bumped into the group a couple more times in the next few days. 60 miles a day: A college physics student from Missouri on a study abroad semester in Spain got off his bike and walked with us for awhile. He bought the bike in Pamplona, made some repairs, and was planning to ride 60 miles a day. There are many bicyclists on the Camino and they yell out “Buen Camino!” as they whiz past. Saving a marriage: “Why are you doing the Camino?” is a common question. A New Brunswick couple who joined us for dinner had an answer we hadn't heard before: They were separated and are hoping Camino will restore their marriage. They said it is going well so far. They have four children and five grandchildren. Sicilian back again: A guy in his 20s from Sicily was limping along on bad knee. He had done the Camino in August and wanted to come back. He had just taken four days off trying to allow his knee to recover. He had come about 160 miles. He had spent his senior high school year in Mesa, Arizona. Today, we saw him in Leon, still limping, but covering at least 15 miles a day. Camino reunion: Beverly and Junior are American women in their 60s doing the Camino together as a reunion…they had not seen each other since high school. Sisterly love: A Texas woman in her early 20s planned a solo Camino, but brought her brother because she thought it would be good for him. She bandaged his blistered feet every morning and was patiently helping him overcome his special needs. Aussie mates: Three Australian oil engineers, in their early 60s and friends for 40 years, are doing the Camino together. It all started when one of the men said he was going; the others asked if they could join him. They booked their flight two days after deciding to go and were here in three weeks. We had a long chat with them over a couple of cervezas. Very nice chaps! Very interesting. It sounds like the “journey” of the Camino takes many forms. We met an Irishman at dinner who has to go home due to a family death. This is the second attempt for him and he has had to quit both times. He vowed to return to the Camino. It sounds as if memories motivate many to capture what was there and not available in any other place. Right…and it brings some back to the Camino. Sounds like some great “Camino Camaraderie!” Will provide lots of great memories I’m sure!! I had read that it was a high point before we came, but it is unlike any camaraderie I have experienced. Sounds like you are meeting so many interesting people. Before you started, did you think that the people would be such a highlight of the trip? Hi Kathy! We knew we’d be meeting a lot of different people along The Way, and looked forward to it. I think Reg and I are both surprised at how fast friendships have formed, if even for just several days at a time. The Camino seems to be a leveling influence. Hi Reg and Sue – the fact that we are back in Denmark now, and still following you (on your blog) and staying in contact to give you our support and receive from you your enthusiasm is also one of the wonderful (side-)effects of doing the Camino…. 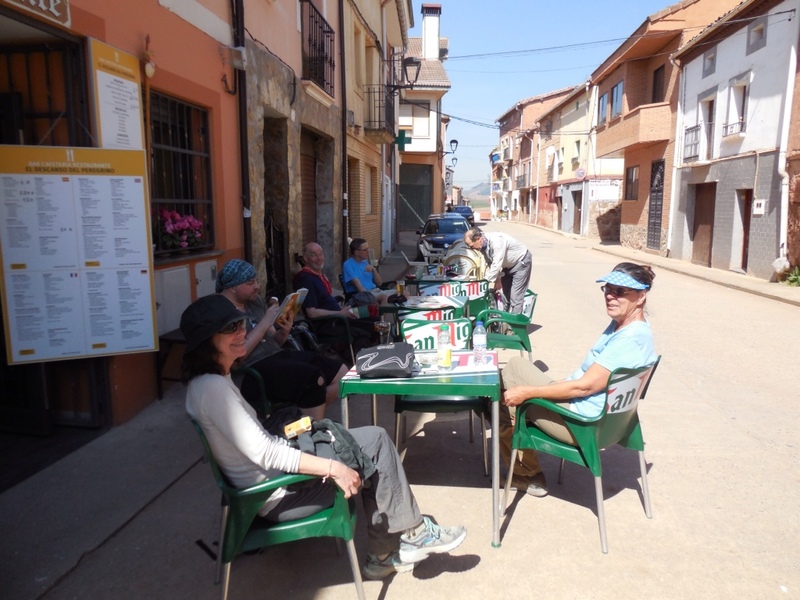 we also have friends we met ( either together or each on our own) on earlier caminos…. none of us are in any way “identical” when it comes to our lifestyles, age, country of origin, beliefs (in general) or means of livelihood… that does not really matter as long as one is (feels like) being part of a walking brotherhood – I always wondered why it seemed to be so easy for many of us to quickly adapt to this kind of lifestyle…. I think the answer is that humans truly do need and want and enjoy to be together sharing a common goal…. there are of course many objections when it comes to the “goal” and many such sharings turn sour later on, when the goal was either not achieved or turned out to be a rotten apple…. as long as the going is not too rough it is good to be together and having fun – but when it gets tough then the spirit of the camino must show itself – is this a game, or is it something we all need to invest the best of our abilities in? What you give is what you get…. remember the parable of the talents????? Bon Camino from Gitta & James in Denmark…. We enjoyed your note and pictures…thank you! You are so right about the bonding of the Camino. It was just a few days together and we felt as though we had known you for a long time. I think that is partly because of being together on the Camino, but also because we just enjoy your company so much. We walked from Leon to Villar de Mazarife today and are in a nice albergue with a welcoming host. Two women from Texas are here…they began their Camino today from Leon.